I like to share to my tourists my knowledges about the Romanian people, about our Hystory, about out Culture, about our Culture. I love to show them amazing places. And they must discover the taste of the Romanian cuisine. And beyond all, I like to show to my tourist the charm of the Romanian people and the uniqueness of our heritage from the Dacian civilization. I can tell about myself that I love the Moldova area. I love the Ceahlau Mountain, the most amazing mountain from the region. I love the Holidays in Moldova, full of traditions ans culinary specialties. And I can tell you I do really enjoy the life from the countryside in Moldova, with our traditions and ancient habits, with our wise old people telling the story of their life. And I do love the Monasteries from Moldova, founded by Moldovian rulers as Stefan cel Mare, places full of History, witnesses of the Moldavian past, places full of prayers and hope and faith. 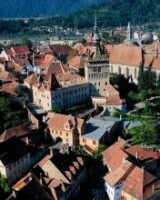 And above all, I love Romania, a gorgeous country!